Today we’re talking about smoothies…green smoothies, to be exact! Are you a lover or a hater of the green stuff? Believe it or not, the first time I had a green smoothie was over the holidays. I decided to give the spinach a try and add it to a fruity blend. As I hesitantly took a sip, I was immediately drawn to the “non-green” smoothie taste! I had imagined a green smoothie tasting like gross, canned spinach…an image that kept me from trying it for a long time. And I’m happy to report that my assumptions were wrong, very wrong! If you’re anything like I was and are afraid to jump on-board the smoothie train, I can assure you that I have the most delicious green smoothie for you to test out. This Strawberry Peanut Butter Green Smoothie is chock full of strawberries and creamy peanut butter, without any hint of spinach in there. Even if you’re not a green veggie fan, I can guarantee that you will not taste it in this smoothie. 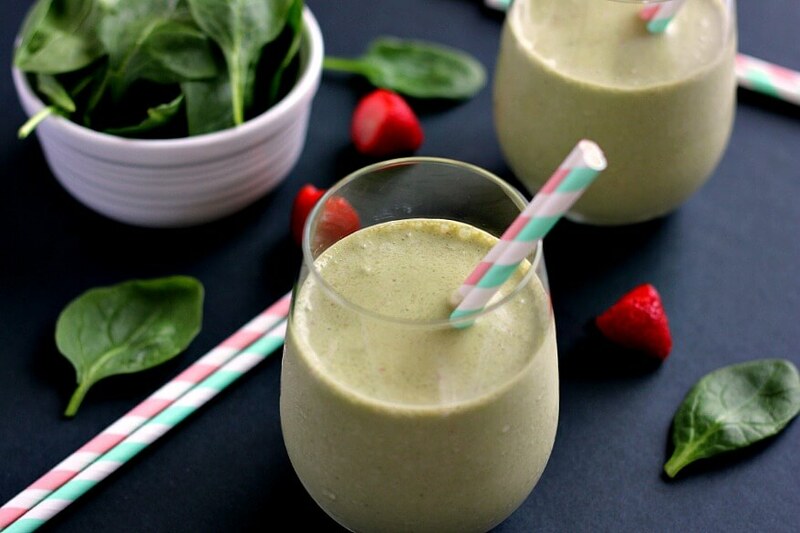 While the spinach leaves add a pretty green color and healthy aspect to this drink, it does not alter the delicious combination of strawberries and peanut butter. I promise! I make smoothies on a regular basis because they’re easy, tasty, and portable. It takes only minutes to whip up and can be taken on-the-go or frozen for a quick breakfast or mid-morning snack. And now that I finally ventured into green smoothie land, this Strawberry Peanut Butter Green Smoothie is my all-time favorite! Since making it the first time several weeks ago, I’ve been hooked ever since. And since it’s nutritious, I feel extra healthy when drinking it! 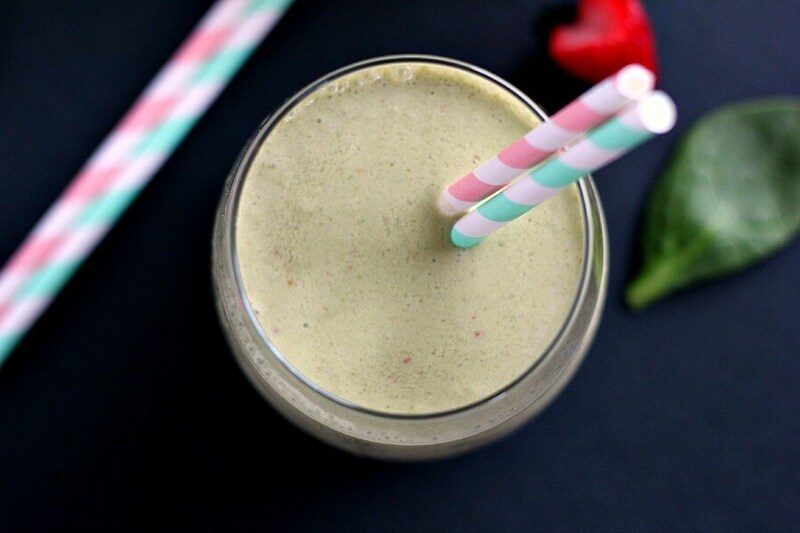 So grab that blender and whip up this Strawberry Peanut Butter Green Smoothie. The spinach adds extra nutrition and the Greek yogurt (my favorite ingredient to use in smoothies and baked goods) gives it a protein-packed punch. 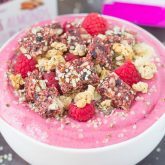 With hints of strawberries and creamy peanut butter, you’ll be amazed at how healthy and decadent this tastes! P.S. Don’t forget to enter the $200 Amazon Gift Card Giveaway ! It’s here just in time for planning a Superbowl party! 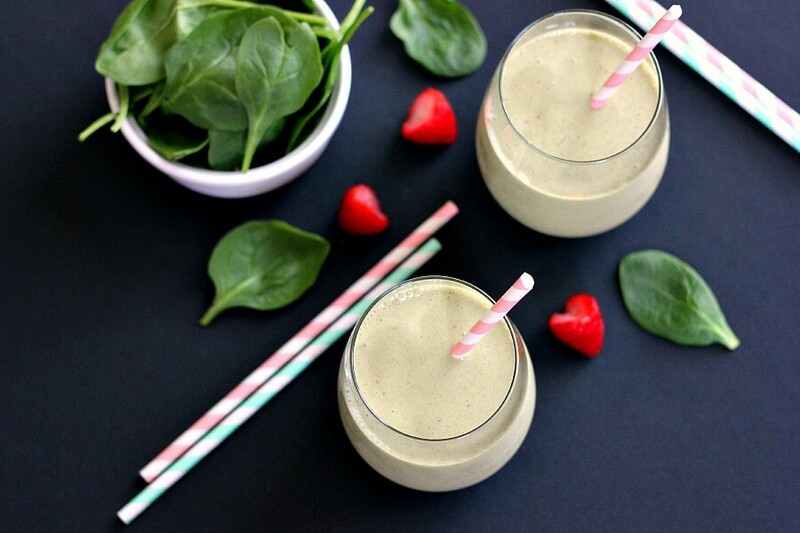 This Strawberry Peanut Butter Green Smoothie combines hints of strawberries and creamy peanut butter, along with the nutritious punch of spinach.You'll be amazed at how healthy and decadent this tastes! In the canister of a blender, combine the spinach, strawberries, peanut butter, yogurt, and milk. Smoothie ingredients can also be frozen for easy preparation. Simply add in the Greek yogurt and milk when ready to blend. I am totally hooked on green smoothies, Vanessa! Especially when there's peanut butter involved...yum! 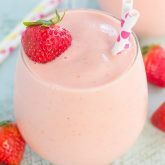 I hope you love this smoothie if you try it! Love the concept, Gayle! Like PB and J in a glass! I can see why you can't taste the green stuff with all those other great flavors! Yes! I love your thinking, Mir. PB and J in a glass is definitely my kind of smoothie! People never believe me when I say that you really can't taste the spinach. I am a big fan of green smoothies, as it's a good way to get some extra veggies in my diet. You can never have too many veggies. Congrats on your first green smoothie! So good! And you are totally right, you can't taste the spinach at all, I'll put up to 5 cups of spinach in a smoothie and although the green color takes over, you still can't taste it. I love how I'm jamming my kids full of spinach and they innocently sip these down. But I do think you need the PB in there =) So delicious. I need to make this today. Thanks, Laura! I haven't tried more than a cup of spinach in my smoothies yet, but I will have to soon. And peanut butter is a definite must for me! I can never get enough PB + jam combos! And in a smoothie with some greens - this sounds delicious!! Your photos are so lovely - smoothies are always so challenging for me to take pictures of and you totally nail it! Me either, Chelsea! PB&J flavors are the best! Thanks so much for the smoothie love! Can't believe you just had your first green smoothie last month! I love 'em. Live and die by them. Spinach is a great way to start because it is practically flavorless. And of course, add PB to anything and I'm sold! I know, right?! Don't know what took me so long! Thanks, Liz! There is no denying that anything with peanut butter is better! This smoothie looks awesome! I too am on the new smoothie bandwagon - I'll definitely be giving this one a try! Oh man, I'm a peanut butter addict! Thanks, Annie! Hope you like this if you try it. I love smoothies and you're totally right...you cannot taste the spinach! I get so excited I'm eating so much fruit and veggies for breakfast. It really starts the day off right. It's a great mind trick, Bri! Definitely a great breakfast or snack! Thanks for the smoothie love and pin, friend! Strawberries and peanut butter make such a tasty combo! This smoothie looks beautiful! Love the flavours. Green smoothies are my go-to snack! Thank you, Jess! I'm definitely hooked on green smoothies now! I would have never thought to combine strawberry and peanut butter. I love it and I'm sure those combine masked the earthiness of the spinach. Such a great treat to start the day! I love adding adding peanut butter to just about everything, and combining it with strawberries is delish! Thanks for the kind words, Jen! Me either, Sarah! I'm definitely hooked on smoothies. Thanks for the kind words, friend! I am a lover of green smoothies! They are amazing. I especially love spinach in my smoothie! Great recipe. I love the spinach in here, too! Such a sneaky lil ingredients! :) Thanks, Kelley! Welcome aboard Gayle! :) It's amazing how the flavor of raw spinach disappears in smoothies, isn't it? I buy giant containers of organic baby spinach that are pre-washed, and freeze 2 cup bags (I reuse the bags for the refills) so I have fresh spinach for my morning smoothies. It's such a great way to ensure that you get your daily allowance of green veggies. Frozen pineapple instead of ice and/or milk makes a creamy, cold, and sweet smoothie too. That's such a great idea, Linda! Thanks for the tip! I'm definitely going to start freezing my spinach and adding some pineapple in. Sounds delicious! Green smoothies are the best. You've inspired me, I think it's going to be my breakfast tomorrow! Yay, so glad you love green smoothies now! Love that you added peanut butter and strawberries, such a great combo! It looks and sounds so delicious and refreshing! Thanks for the sweet comments, Kelly! I'm so glad that I finally tried green smoothies, too! Thanks, Shashi! I love how the spinach is hiding in here. Can't taste it at all! I was cleaning my pantry yesterday and saw a container of peanut butter, which reminded me I haven't had any in a while! Will try this smoothie today! Thanks for sharing Gayle! Pinned! Pictures are awesome! Thanks for the kind words and pin, Mira! I hope you love this smoothie if you try it! I'm a huge lover of the green stuff!!! I love adding kale but my husband and kids prefer spinach over kale. . so this one's a winner for sure!!! love!!! I'm definitely going to give kale a try, Alice! Thanks for the smoothie love! I agree, Marcie! It's such a sneaky way to add in some greens, but I love it! And the Greek yogurt is an added bonus, too. Gives it a nice tang! Haha eww! I don't think lettuce would taste very good, but that's a funny story! I don't think I'm ever going to stop with the green smoothies now! Sounds like this would make a much more sensible mid-morning snack than the ones I often opt for (lookin at you cookies etc.!) I actually have never tried a green smoothie but somehow I feel I'm missing out ... especially with this one packed with pb and strawberry. Like a pb & j sandwich in liquid form ... mmm! Oh you should definitely try a green smoothie, Helen! It's SO good! I love spinach but was kind of freaked out by adding it in, but you really can't tell it's there! I think you would love it in this smoothie, Valya! Thanks for the kind words! I like pb and jelly sandwiches, but never tried peanut smoothie before! This sure sounds interesting, would love to try! thanks for sharing, Gayle! It sounds like this smoothie was made for you, Savita! I think you would love it! I love smoothies Gayle! this one sounds delicious ;-) I love the use of Strawberries AND PB! I have never tried that before! it sounds perfect! Thanks, Michele! This is one of my favorite smoothies! Gayle, great minds think alike. I posted a smoothie today too. Mine was suppose to be green, buy is more gray. Yours is green and looks delicious! I've never thought of adding PB!! Great idea! Pinned!! I think your gray-ish smoothie is gorgeous, Cyndi! And it's the flavor that counts. You should definitely try some peanut butter the next time you make one, it's delish! Thanks for the kind words and pin, friend! Yum! Seriously, anything with peanut butter is automatically a fave of mine... love the strawberries too! Peanut butter is the best! Thanks, Medha! I love me some green smoothies!! And I love all the peanut butter you have in here - sounds deeelicious! Thanks, Renee! This smoothie is delish! 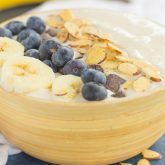 I think you'll love green smoothies, Manali! Especially with peanut butter added in...it makes it extra delicious! I thought green smoothies would be gross as well! I would SERIOUSLY love to try this! I think you would love it! You can't taste the spinach in here at all! Yay!! I am so happy that you tried green smoothies over the holidays and loved them! :D I honestly remember being *very* suspicious of the ideas of greens in my smoothies at first but now I need my green smoothie fix everyday! :) Drinking mine right now as I'm reading this and wish I had the one you've created here. 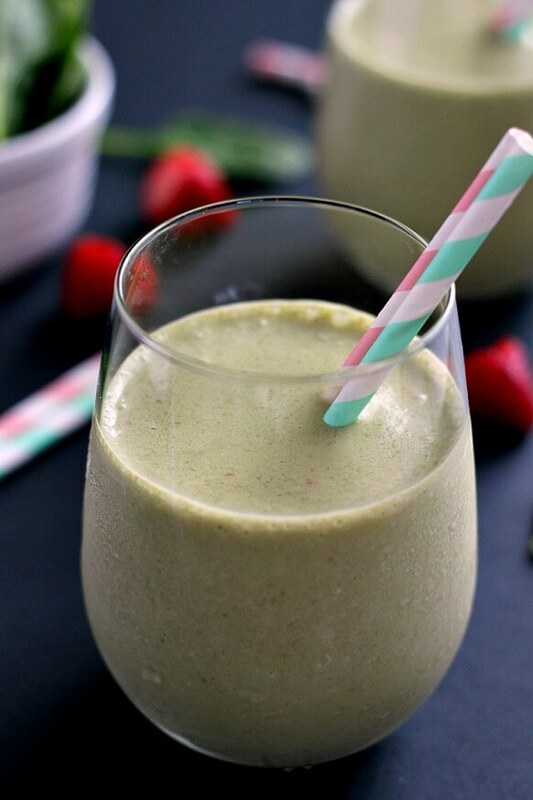 This green smoothie is perfect by the way - strawberries and peanut butter make such a delicious combo!! Pinned! Have a great weekend my friend!! I'm so glad I finally tried it too, Ceara! I wish I would've tried green smoothies a long time ago! Thanks so much for the kind words, friend! Have a wonderful weekend, too! Green smoothies are my favorite!! And I love this version. The best! Thanks, Dorothy! It's so good! Haha! I totally thought the same thing about green smoothies! How could they be so green and not taste terrible?! Yours looks fabulous! Pinned! Haha right? If only I knew what I was missing all this time. Thanks for the pin, Lindsey! Love green smoothies! I've never put peanut butter in with strawberries before though, definitely need to try that! This smoothie looks delicious Gayle! You should definitely try it, Olivia! I think you'd love them! Ooo, I think I'd really like this one! Great recipe to have on hand when I need to use up some spinach. Sounds like a great breakfast, too! Thanks, Leah! It's been my morning breakfast all week! I just got a new nutribullet for Xmas. I am so into smoothies and smoothie recipes. This one is a winner. I had to pin it. If for nothing else then I love it's refreshing color. Ha! Thanks so much, Carol! 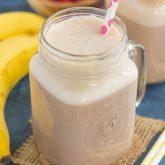 I hope you love this smoothie if you try it! I love adding spinach to smoothies, since I'm not the best at getting my veggies in each day. I love this version, Gayle! I'm giving this one a try the next time I make one, I have everything for it too. Thanks, Danielle! Spinach is a great way to sneak your veggies in! Mmm I love green smoothies, and I love peanut butter even more so this looks like my perfect breakfast! Yummy :) totally need to try this. Thanks, Rachel! The peanut butter makes this extra delicious! 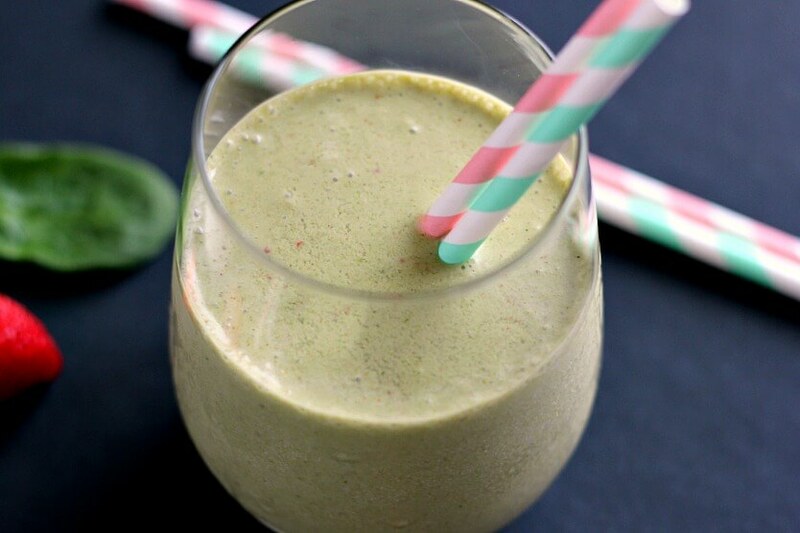 Now this is one green smoothie I could definitely stomach! Love anything with peanut butter - so the addition in this recipe is just perfect. I was shocked at how good this smoothie tasted, Megan! I definitely was not expecting to taste fruit and no green stuff! :) Thanks so much for the kind words and for stopping by! Thanks so much for the kind words and pin, Catherine! I just made this smoothie but added some banana's, used both Kale and Spinach and instead of milk I used Vanilla Almond Milk with a hint of Honey and it was Delicious! I love that you added some extra ingredients to this smoothie, Arlyan! Sounds delicious, especially with the bananas. Thanks so much for stopping by and glad you enjoyed this!